VOSA offers you the posibility of downloading all the results in several formats. 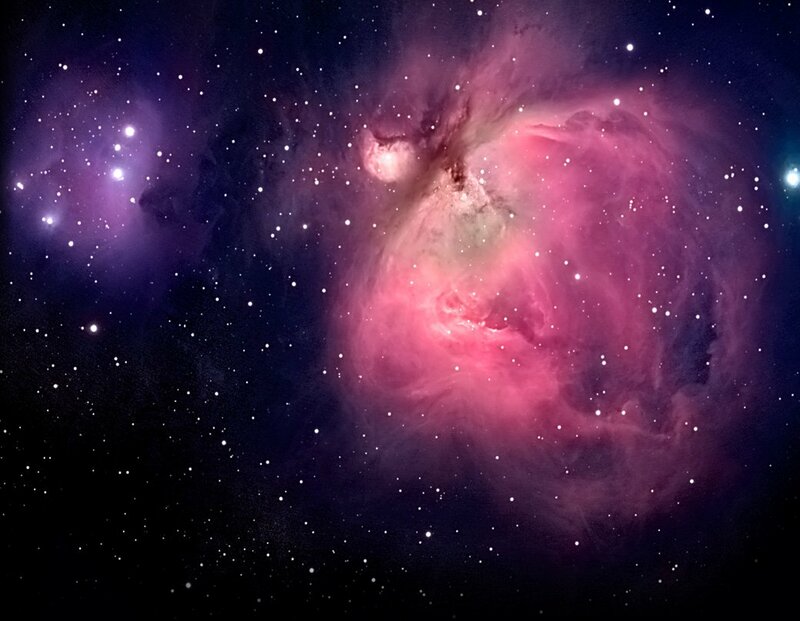 VOTable files (.xml), with data in the preferred Virtual Observatory format. Plots (.png, .eps, .agr) in different formats. In order to get the available files, enter the 'Save results' panel. 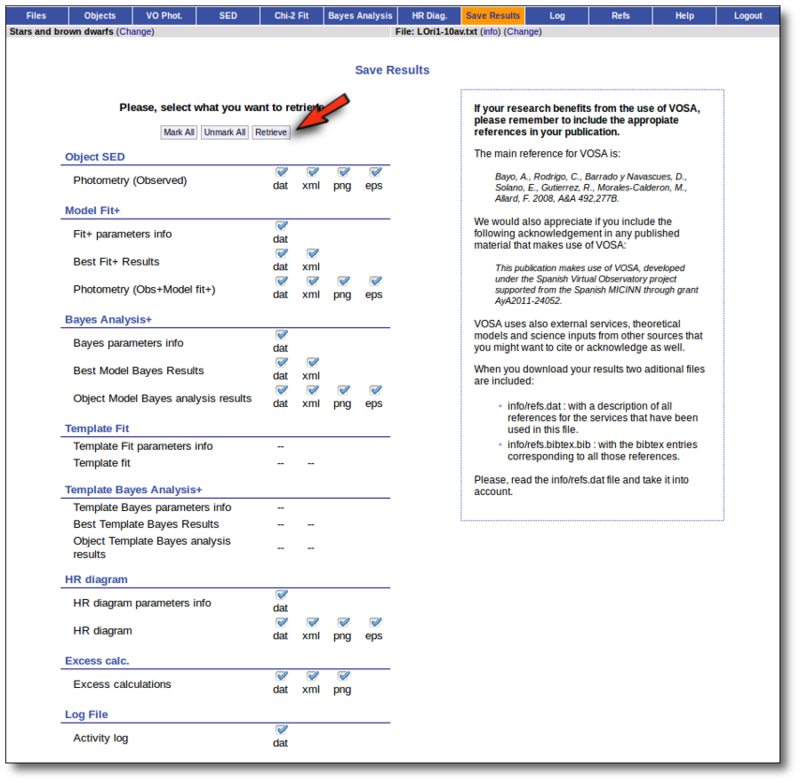 You will see a form where you can select what results you want to download and in what formats. Obviously, if you haven't generated results of some type yet, they will not be available. For instance, you can mark all the available options and click the "Retrieve" button. 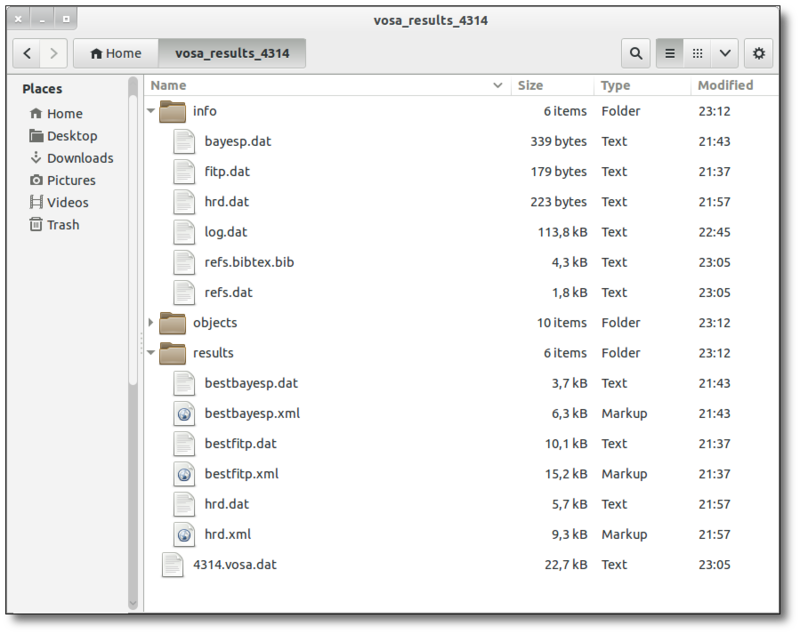 VOSA will make a compressed tar file with all the information so that you can dowload it. A file .vosa.dat. This is a file in VOSA format, with all the info for your objects, including photometry (user data and values obtained from VO services), distance, extinction, excess information, etc. 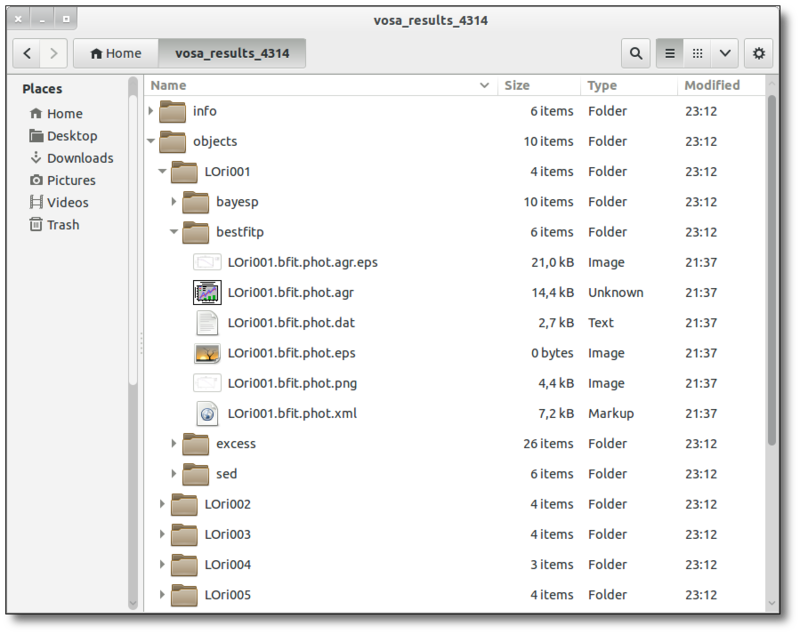 You can upload this file again into VOSA and recover the same SEDs that you have here so that, for instance, you can apply the analysis tools with different options. info/log.dat with the log file. info/refs.dat with a text description of all the references of services used. Files like info/fitp.dat with info about the models/templates and parameters used for analysis. The results/ folder contains files with lists of results for all the objects. For instance, best fit results, bayes analysis results, etc. The objects/ folder contains a subfolder for each object. The objects/OBJNAME/ folder contains more subfolders, with files with info corresponding only to the object named OBJNAME. .dat files contains ascii data. .xml files contains a VOTable version of the corresponding data. .png are graphics in PNG format. .eps are postscript versions of those graphs. .agr files are versions of those graphs that can be edited by xmgrace if you need to improve the graphics.